Geothermal Heat Pump Market Report « Global Market Insights, Inc.
Increasing demand for renewable and cost effective energy solutions is providing geothermal heat pump market a strong business ground to expand in the coming years. Fluctuating crude oil prices have resulted in a shift in consumer trend toward stable energy solutions such as geothermal heat pumps. The regional governments have played the role of a catalyzer in the growth chart of the industry over the past few years. Initiatives which include financial supports, federal income tax credits, rebates, subsidies, renewable heat incentives have encouraged the adoption of non-conventional energy sources, which otherwise catered geothermal heat pump industry share. Cost effectivity, seasonal flexibility, eco-friendliness, and minimal maintenance cost are some of the attributes that make geothermal heat pump market one of the fastest growing renewable energy based industries. Unique ability to use underground temperature as a heat exchanging medium for both heating and cooling purposes is expected to boost the industry growth in the years ahead. However, expensive installation of these heat pumps is somewhat acting as a deterrent in the growth curve. In order to mitigate this issue, key players of the market are heavily investing in research activities to minimize the manufacturing cost of geothermal heat pumps. Closed loop products are expected to gain massive traction in the overall geothermal heat pump industry. These systems can be installed either vertically or horizontally depending on the size of the plot. Minimal maintenance and operational cost, superior reliability, higher efficiency, and flexibility make it the most suitable choice for the investors. Vertical installation gains a popularity over horizontal one due to its less space requirement. As per the estimates, closed loop geothermal heat pump industry is slated to carve an appreciable growth chart over 2018-2024. On the other hand, low installation cost and comparatively less heat transfer make the market demand high for open loop installation. Geographically, North America and Europe have a strong foothold in the global geothermal heat pump market. Several beneficial initiatives taken by the U.S Government and European Union to promote the adoption of renewable energy resources for daily usage, is chalking a profitable road map for these geothermal heat pump markets. For instance, in 2030 climate and energy framework, EU underlined a target of reducing greenhouse gas emissions up to 47% within a period of 13 years. It also projected that by 2030, renewable energy utilization will cover 27% of the total consumption. Germany has been touted to be one of the major revenue contributors for the Europe geothermal market. Indeed, the nation announced to invest over USD 250 billion in the country’s geothermal heat pump infrastructure. The U.S. geothermal heat pump market which accounts for a major portion of the North America industry, is projected to accumulate hefty proceeds by the end of 2024. This can essentially be attributed to the ever-increasing expenditure in the construction of single house buildings across the regions of the Northeast and Midwest U.S. In addition, the availability of consistent shallow ground temperature will also help expedite the U.S. geothermal heat pump market share. Furthermore, the North America geothermal heat pump market is also expected to be supported by the government measures that are being undertaken to increase the adoption of renewable energy sources and reduce the carbon footprints across the continent. Indeed, the regional governments have been proactive enough to introduce tax credits and rebates in order to encourage the penetration of geothermal energy heat pumps. 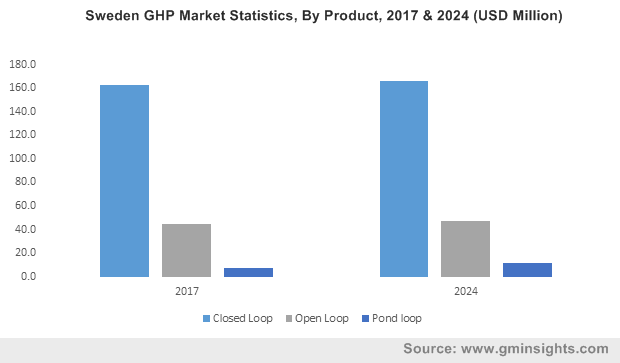 The global geothermal heat pump market is fragmented with players pacing toward moves such as strategic collaborations and regional expansion to sustain the competition. Prominent geothermal heat pump industry participants include Kensa Heat Pumps, NIBE, Robert Bosch, Finn Geotherm, Glen Dimplex, and Stiebel Eltron. This entry was posted in ENERGY, MINING, OIL AND GAS and tagged Geothermal Heat Pump Industry, Geothermal Heat Pump Manufacturers, Geothermal Heat Pump Market, Geothermal Heat Pump Market Analysis, Geothermal Heat Pump Market Growth, Geothermal Heat Pump Market Outlook, Geothermal Heat Pump Market pdf, Geothermal Heat Pump Market Price, Geothermal Heat Pump Market Report, Geothermal Heat Pump Market Share, Geothermal Heat Pump Market Size, Geothermal Heat Pump Market Trends.